Peyton is hanging out with her friends. 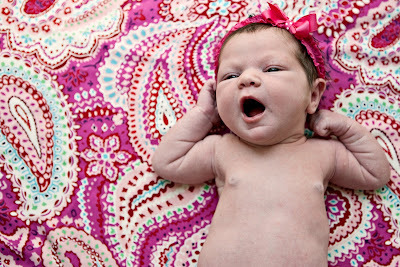 She is 5 weeks old now and I feel good about taking care of her and Tanner by myself. At least I was until Tanner got sick. When he woke up from his nap on Thursday he was so hot. His eyes were red and his skin felt like it was on fire. Like a new mom of 2 kids I called Kipp to come home early from work. And like a good dad, he did. I took Tan to the doctor while Kipp stayed at home with Peyton. Tanner had a temp of 102 and had pink eye. Poor guy. Kipp spent 2 nights sleeping in Tanner's room waking up to blow his nose and give him drinks. Saturday Tanner broke out in a rash so this time Kipp took him to the doctor. They told us that the rash was a good sign and it meant the infection was leaving his body. By Saturday night we were all feeling bad.Tonight Kipp is sleeping downstairs so he doesn't get me or Peyton sick. Tanner's fever has gone down but now Kipp has a high temp. As for me and baby girl we are just stuffed up. We are drinking lots of fluids and watching a lot of Mickey Mouse Clubhouse. If I were you I would stay away from our house. Today we went to our friend Emma's Birthday Party inside of Disneyland. Emma is Derek and Jackie's niece. Jackie and her family helped me with both kids. While we were having lunch several Princesses came by our table to say hello. It was all so sweet! Tanner LOVED seeing them. After one would leave he would say, "more princess." He gave them big hugs, kiss them on the hand and then blow them a kiss as they would leave. One of the Princesses called Peyton Sleeping Beauty because she slept through the whole thing. It was funny that Sleeping Beauty was the one princess that Tanner didn't really like. I have no idea why. This was Peyton's first Birthday Party so she wore her cupcake outfit. This picture brought tears to my eyes. I just thought it was so precious! Snow White and two of her little dwarfs. We ended the great meal with a plate full of different deserts. Tanner had such a good time. He was so tired after our day that he went to bed at 6:30. It was a day that we will remember for a long time. Happy Birthday Emma Rose! Peyton is getting clean in her bathroom while Tanner helps wash her. She liked when we washed her back. She is sleeping well! I am so lucky! Tanner is doing better every day and now he doesn't cry when he goes to the babysitter. We have been to church 2 times and he has cried both times. We are adjusting well to being a family of 4. We have a 2 year old and a 2 week old! Hi friends-Just a little update on the new life that we are living. Peyton is doing great! She is 2 weeks old now. She gained her birth weight back in 1 week. Tanner is adjusting to sharing his time with Kipp and I. Yesterday we went to church and Tanner cried so much that Kipp had to stay with him in his class. He has also started to cry when Kipp drops him off at his babysitter's house. He never used to do that. Poor guy. He just wants to be with us all of the time. He wants to make sure he is not being replaced. Like that could ever happen. We had Tanner's birthday party a few weeks ago but Saturday was his real birthday. 3-7-07. We went to the Legoland aquarium called Sealife. We had such a great time. Grandma Lyons came with us and we were all so impressed. I thought it was perfect for Tanner's age. Everything was at eye level for Tan so we didn't have to lift him up. We were there for about 2 hours which was the perfect amount of time for me. Peyton went to visit both of her grandparent's houses this weekend. She is doing so good and we are so in love with her. Last night we all went to watch Kipp play in his church basketball game. Tanner thinks that Kipp is playing basketball every time he is not with us. The funny thing is that he tells people, "Daddy Basketball." Then people ask me if my husband is a porfessional basketball player. Don't I wish. My friend Christie posted more pictures if you would like to take a look. Please look at my friend Christie's Blog. It's called Christie's Pictures. There are som of the best pictures I have ever seen. Yes-they are of my kids! You will not believe how cute they are! Do it now!